Read a Q&A with Mike Losey in HR Magazine's Book Blog. Read an excerpt about 'Sunday Afternoon Syndrome'. Mike Losey explains the 'Five I's of Leadership'. 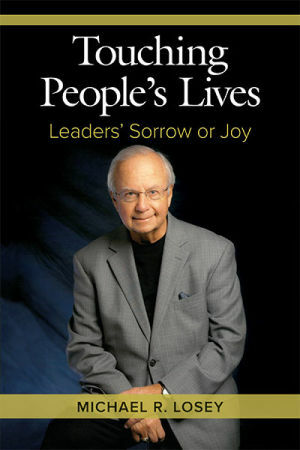 In Touching People’s Lives, Mike Losey, former SHRM CEO and master storyteller, offers a wellspring of experience and inspiration on the challenge for all leaders charged with the development of people to responsibly cultivate compassion, integrity, courage, and accountability in all they do, regardless of how difficult the challenge. Along the way Losey gives readers a front row seat to many of the major developments in the field of Human Resource Management and reveals his own journey of connecting HR to the business, managing diversity, working on competencies, ensuring ethics, and helping to create a profession. He also challenges HR professionals to aspire to be more than just exceptional leaders, but HR leaders who engender exceptional leadership throughout their organizations. Michael R. Losey, SPHR, CAE,is a past president and CEO of the Society for Human Resource Management (SHRM). Before being named to the Society’s top position in 1990, Losey previously served 30 years in HR management and executive level positions with two Fortune corporations. He has been active in international human resources and is a past president of the North American Human Resource Management Association (NAHRMA) and the World Federation of Personnel Management Associations (WFPMA). He has also served on the board of directors of SHRM, the SHRM Foundation and the Human Resource Certification Institute. Losey has authored more than 60 articles, co-edited Tomorrow’s HR Management (John Wiley & Sons, 1997) and The Future of Human Resource Management (John Wiley & Sons, 2005). He has previously testified in Congress on pending workforce and labor issues. Chapter 15 When You Discover Something Is Just Not Right, What Do You Do? Chapter 16 What Would You Do If You Were the CEO?